I don’t see any other interpretation than that he was using two (in fact, two point zero) as his critical test value, which we have already mentioned is completely wrong. Curtin claimed that the absence of autocorrelation is required for valid regression, which is also wrong. Nonetheless he uses that claim to justify requiring regression be performed on differenced variables. Curtin isn’t the first (and won’t be the last) to claim that regression of climate variables like global temperature should be done using differenced variables. For example, a recent commenter on RealClimate by the handle “t.marvell” did the same, justifying it by insisting that global temperature was not a stationary time series. Of course it’s not stationary — it shows a trend! Neither of those individuals seems to understand the impact that first-differencing has on regression analysis, especially when the causal relationship we’re interested in has to do with the trends which are present. Let’s give that some consideration. The coefficients and are the intercept and the slope of the line relating y to x. The quantities are random noise, which may or may not be white noise, i.e., it may or may not show autocorrelation. If we regress y on x, we get estimates of the coefficients and . We can also compute the residuals, which are estimates of the noise values , with which we can test whether or not they show significant autocorrelation. We can further test whether the regression itself is statistically significant — but if the noise shows autocorrelation that has to be taken into account when testing for such significance. Take note that the principal source of correlation is the fact that they both show a strong upward trend. Of course, correlation isn’t causation. With this artificial data, we know that x causes y because the data were designed that way. With real climate data, we know that climate forcing causes temperature change because of the laws of physics. The slope of the best-fit line is 0.0103 +/- 0.0008 and the fit is certainly statistically significant. We can test for autocorrelation in the residuals, either by computing the sample autocorrelation function (indicating no statistically significant autocorrelation, which we already knew), or by performing the Durbin-Watson test. The DW statistic is 1.606, which for this sample size is also not statistically significant of autocorrelation. Bottom line: the fit is significant and the slope is correct within its error limits — in other words, we got the right answer. This fit certainly doesn’t look very good. We find that it’s not statistically significant. 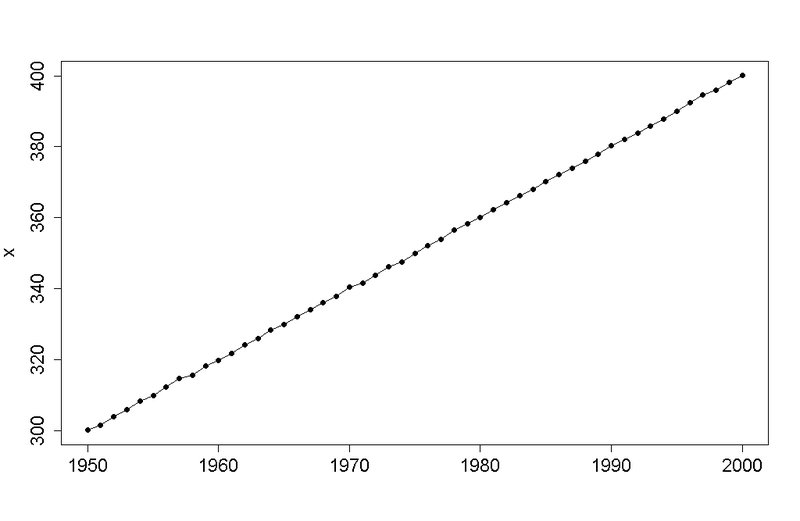 The slope of the line is 0.03 +/- 0.09, which is actually bigger than the real slope! But the probable error is so large the result is meaningless. In other words, we got the wrong answer. The sample autocorrelation function now indicates that there is autocorrelation in the residuals (at least at lag 1), but it’s negative. The Durbin-Watson statistic is 2.886, which once again is significant, but of negative lag-1 autocorrelation. But by Tim Curtin’s criterion we would conclude that there’s no autocorrelation, and by the logic he used in his paper we should conclude that there’s no relationship between x and y because there’s no statistically significant relationship between X and Y. Again, that’s the wrong answer. where C is some constant. In other words, by including an intercept ( ) for the straight-line fit of the first-differenced variables, we automatically include a time trend in the undifferenced variables. But, since the variable x very nearly follows a straight line, we now have the problem of collinearity, that two of our regressors are very nearly equivalent. That can wreak havoc with regression. Notice: there’s no intercept term in this model. Notice also that the noise is no longer white noise, it’s first-differenced white noise (a.k.a. 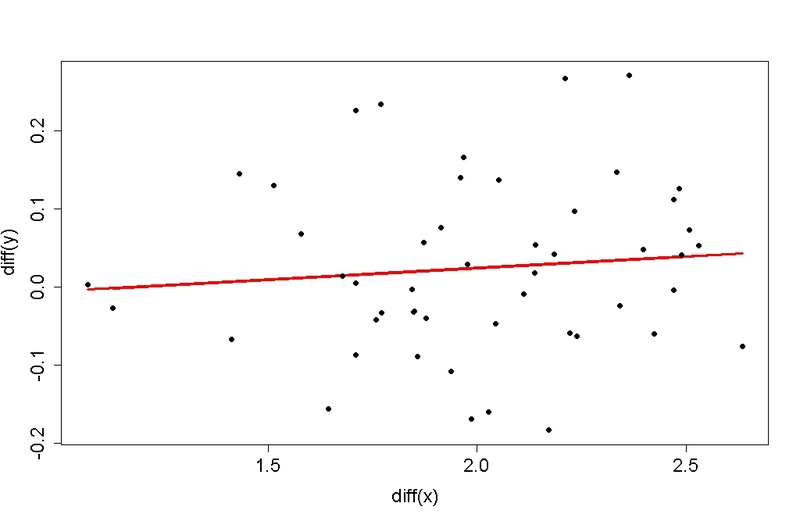 MA(1) noise), which is why there’s (negative) autocorrelation in the residuals of the fit of Y on X. By the way, we can fit this model (with no intercept term) to our first-differenced data. Then we get a slope estimate of 0.013, which is much closer to the right answer, but the 2-sigma uncertainty is +/- 0.015 and the fit is not statistically significant. That’s because when you first-difference the variables, but don’t confound things by inserting a spurious intercept, the uncertainty in your result is increased dramatically. There are situations in which analyzing first-differenced variables is extremely useful, sometimes even necessary. If, for instance, the noise had a “unit root” then we might want to difference the variables. Or, we might be primarily interested in the effect of the short-term fluctuations of x on those of y, in which case we could first-difference for the specific purpose of removing the trend from each. But to know the overall impact of our artifical x on our artifical y we want to avoid differencing — because we know how the data were constructed. To know the overall climate impact of greenhouse-gas forcing on global temperature, likewise we want to avoid differencing — because of the laws of physics. As I said, lots of folks want to first-difference climate variables, but there’s no justification for doing so. More to the point, I doubt that many of them (or perhaps even any of them) really understand the impact of what they’re doing. But they sure seem to like the answers it gives ’em. Meaty, especially for one such as meself whose statistical smarts are pretty limited. I’ll be coming back to this one. Over and over again, it seems like contrarians could really benefit from the exercise of applying their methods to artificial data. 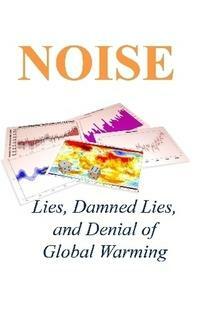 For the Tim Curtin’s of the world, this is easy, because it is just a global temperature trend plus noise. *Off the top of my head I can think of Spencer, Salby, Essenhigh, all of whom have done real science in their own fields and shouldn’t have fallen for something so simple. **And I mean a real model, not the Bern cycle approximation, even if people like Eschenbach think that the IPCC actually bases its projections on a 4 exponential sum. Essenhigh is a determined denier. You should see his 2001 paper on how adding CO2 doesn’t matter because the IR from the ground is already saturated at ten meters. Ah, but when we apply the D-K test to Tim Curtin, we find the result very significant. Nobody could be so cynical, so blatantly… oh, wait. Laugh. But I have read “He couldn’t the result he wanted with real data so he used fabricated data”. Sigh. Can’t find cadf for R do you mean “CADFtest”? Three models, I mean–no intercept, intercept, and intercept plus time term. Tim Curtin is in major denial. He doesn’t understand the basic realities of the physical world and tries to manipulate data to suit his delusions. I have argued with him before about his egregiously incorrect statements about increased agricultural production from the past 30 years being solely due to CO2 increases. He fails to understand that CO2 is not the limiter of plant growth, water is. He likes to use the trope of CO2 is plant food, despite the fact that it only improves water use efficiency when all other nutrients are unlimited. Basically, Tim Curtin’s claims don’t pass peer review, doesn’t surprise me his maths doesn’t either. And mathematics, not so much. One can put the argument into slightly different terms, which might be more familiar for some folks. Differencing is similar to differentiation, and both act as a high pass filter. This either exagerates high frequency noise or reduces (or eliminates) low frequency signals, whichever way you like to look at it. If you try to relate the filtered signals to each other, you cannot see much if any low frequency behavior, because it’s been filtered out already. You can’t come to any legitimate conclusions about low frequency behavior if you filter it out beforehand! I’m not a statistician, but just try to be careful in my own statistical analysis. My impression was that it’s impossible to confirm/validate a null hypothesis with respect to any time series, distribution, etc. There’s always the alternative hypothesis that there’s some unknown, purely deterministic source for whatever signal you’re measuring. Alternatively, you can add unbiased noise to any data set to make it impossible to reject a hypothesis, which seems to be what’s effectively going on here. Good grief … did he really take the first difference of both sides of the equation? The point of taking differences is to undo an integration … if you differentiate both sides, you haven’t accomplished anything, other than to amplify noise and render the slope meaningless! Thanks for this post, it’s helped to further my own understanding. I tried to get Tim to understand these issues via gentle prodding here https://theconversation.edu.au/no-one-likes-to-change-their-mind-not-even-on-climate-6674. Despite my own inexperience with time-series analysis of this nature, I knew that differencing couldn’t be a correct analysis because similar simulations to those in this post led me to the understanding that differencing is a low frequency filter (a poor one at that – further investigations yielded that de-trending [ideally with splines] is more useful, and in Tim’s case, a more honest technique for his purposes). I then tried pointing Tim towards independent expert advice here http://stats.stackexchange.com/questions/27748/relationship-between-two-time-series-arima with yearly CO2 and temp time series unlabelled to try and remove possible prejudice from knowing the data set, but still no understanding of the issues from Tim. Although I doubt he read the stats.stackexchange post. tl;dr: to calculate a p-value you assume that the null hypothesis is true. Because it’s assumed true, you can’t turn around and use a low p-value to establish that it’s true. somewhere out there I noticed TC now says he got something wrong but his conclusion is still correct. TC, say it here? OK, thanks. Deltoid will sort him out if anyone can, or tell him if he’s gotten something right; not holding breath tho’. It’s amazing what sometimes does get published before statisticians weigh in. My Statistics teacher, almost 40 years ago, said there was one thing we should all take away from the class: consult a statistician _before_ collecting data and trying to analyze it, not afterward. Because afterward, they will tell you you did it all wrong, quite likely. “The motivation is the observation that the proxies are only weakly correlated with the temperatures during the observation period 1850-2000. Furthermore, standard Lasso regression which has been used in the past for temperature reconstruction is sensitive to spurious correlations due to autocorrelated inputs. And some of the over 1200 proxies are autocorrelated. Thus, in case the relation between proxies and temperatures is indeed nonexistent, that is if proxies had no predictive power about past temperatures, the lasso would still find “relevant” predictors and will happily fit a model to the observations. claims to be peer reviewed and based on astrophysics. Yeah, I’ve run across Nasif before. Suffice to say that his learning curve doesn’t have a positive slope. The irony is that even though he claims to be doing a “quantum” calculation, he utterly ignores the quantization of the energy in the harmonic oscillation of triatomic molecules. Oh, and his “peer review” is just of a faculty member at his university. He’s not quite all there. Hank, that article was hilarious. Spelling mistakes and odd terms used in a peer reviewed paper?? Not likely. Completely missing the basic principles of excitation and energy dispersion. Lols! 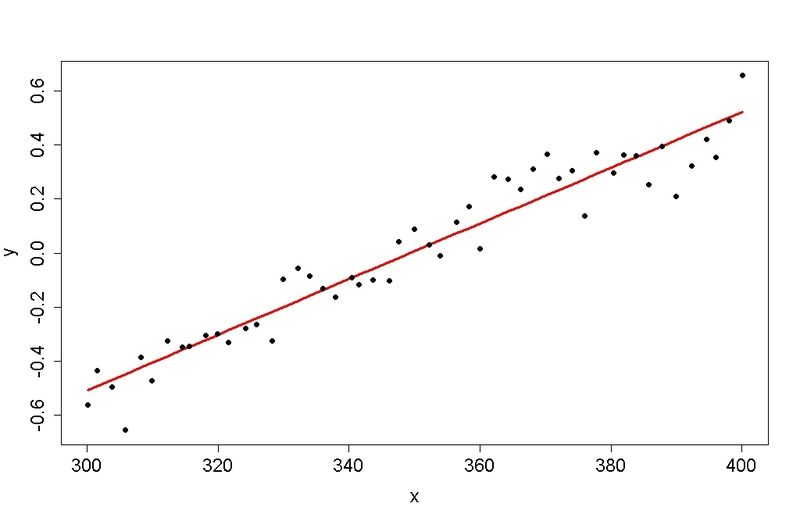 If one regresses one non-stationary variable on another, one gets a spurious regression (the standard errors are much too small). In that case, one must difference the variables, unless the two variables are cointegrated. The latter means that the residual in the regression is stationary – i.e., that the two variables tend not to move too far apart over the long term. In the example in the post, the two variables would probably be cointegrated, although one would have to do a cointegration test to determine whether that is the case. Neither correlations nor cointegraton establish the causal direction, and one cannot assume that temperature changes do not cause changes in greenhouse gas levels. 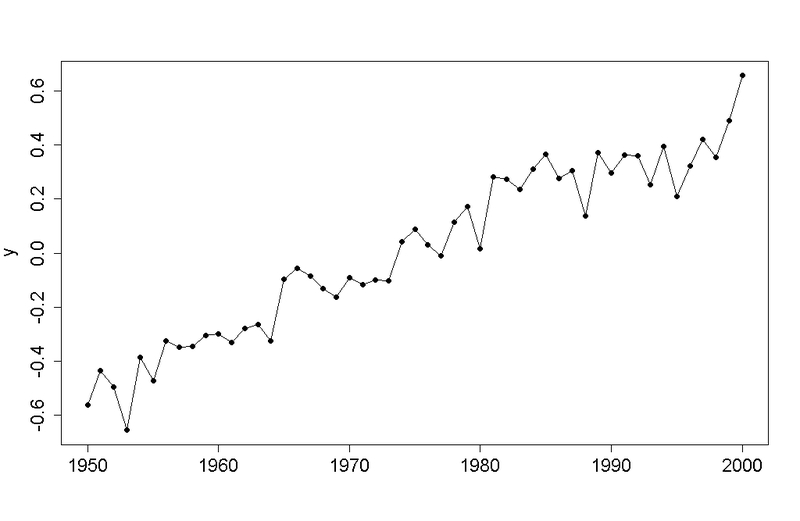 On all these points, see Kaufman, Kauppi, and Stock, Emissions, Concentrations & Temperature: a Time Series Analysis. Climate Change (2006) 77: 249-278. I dunno… I get four negatives, but maybe there’s a definitional issue. Naive question: is it proper to define your null (or “nul,” as TC calls it) however you want to? I have to say, going by the current extraordinary nonsense that he’s spouting at Deltoid, there’s a certain ugly beauty to Curtin’s bizarre mangling of basic science. The guy is either a magnificent idiot or a magnificent Poe.